This is a surprisingly scenic run that did not appear in early guidebooks. 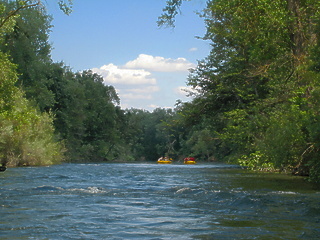 It has become popular in recent years, for both canoeing and rafting. 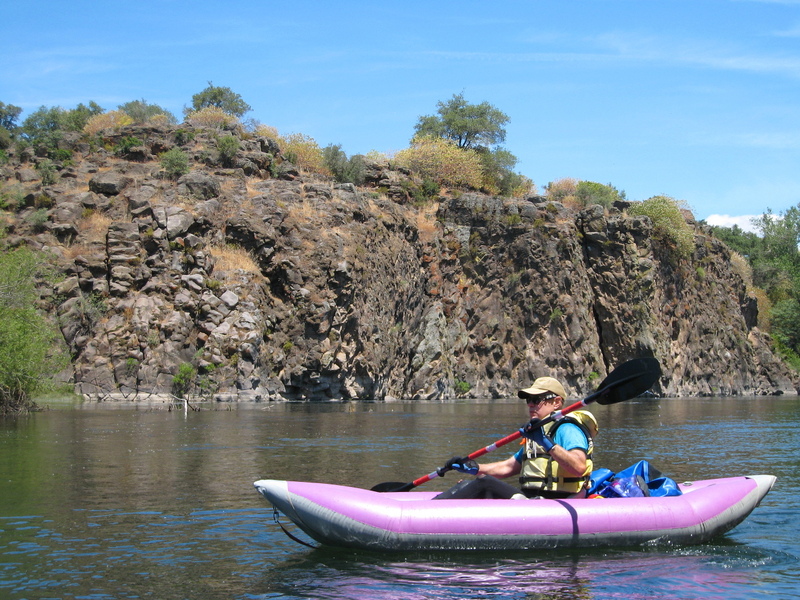 At least two outfitters rent boats for self-guided rafting trips. 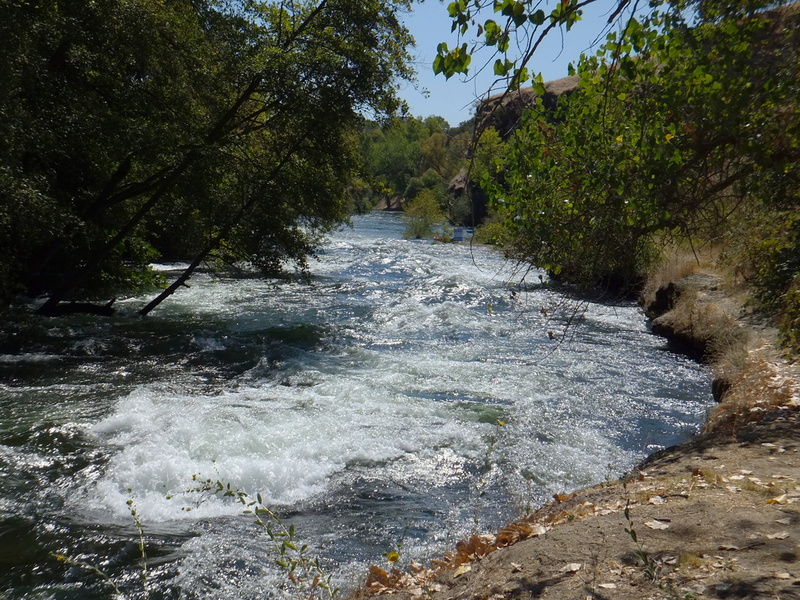 This stretch is very close to population centers, and has reliable summer and autumn flows from dam release. 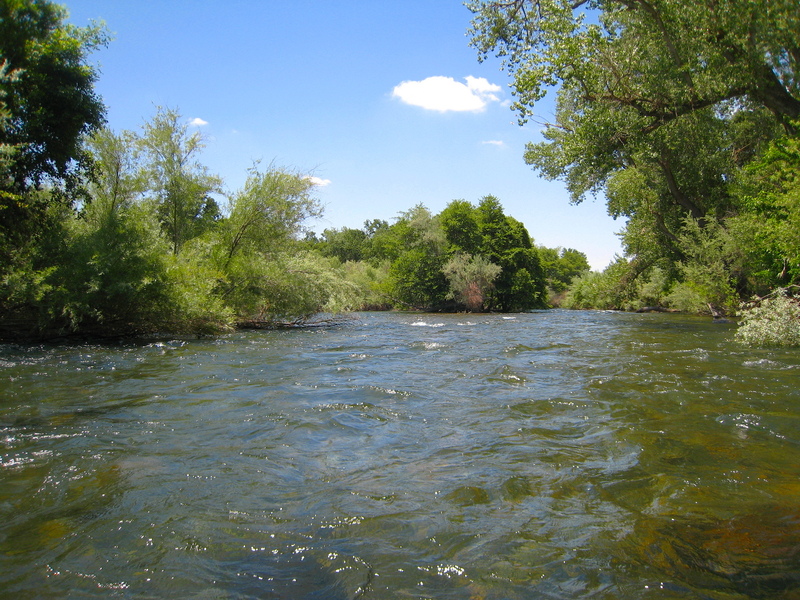 Often in the fall, dam operators release higher flows for recreation. 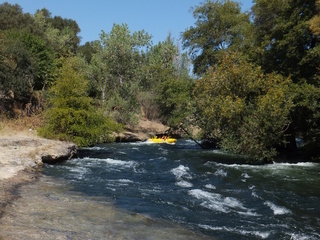 However even at moderate flows, boaters get moving current most of the way. The run starts with a bang: a long class II rapid begins shortly below put-in. If you don't want to run the class II rapid, or if you elect to carry back and run it multiple times, there is a good portage trail on the left bank. After this class II rapid, the river flows thru some scenic lava outcroppings then along a basalt escarpment named Lover's Leap. Shortly after, there is a beautiful boat-in campground on the right. Finally, the river winds thru a secluded riparian zone with willows lining the channel, sometimes past houses, but seldom near a road. Because of brush hazards, it is advisable to avoid this section at flood stage. 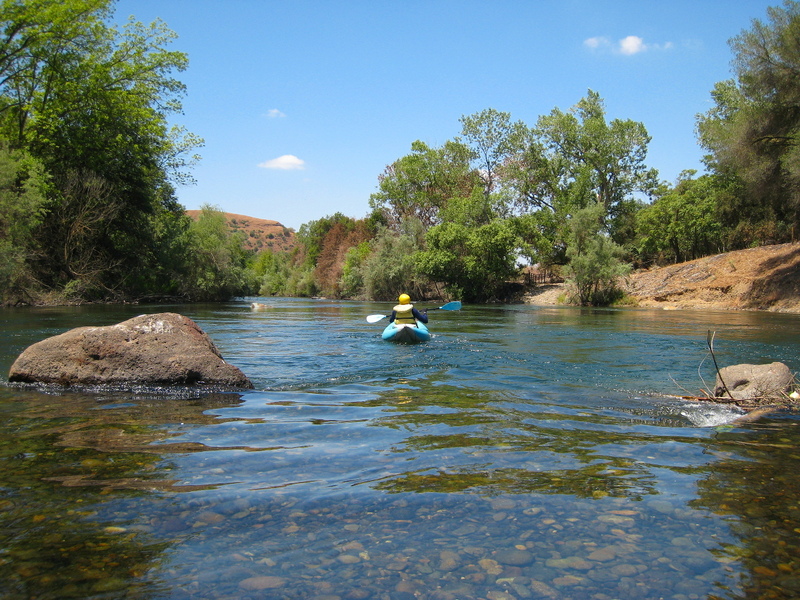 If you seek adventure, more difficult whitewater lies upstream. Below Goodwin dam is a class V run with rapids named after rides at Disneyland, such as Mr. Toad's Wild Ride, Matterhorn, and Haunted House. The Disneyland run has access halfway down, at Two Mile Bar, allowing boaters to avoid all but Haunted House, which can be portaged. Put in on the right bank upstream of the new concrete bridge connecting highway 108/120 to the town of Knight's Ferry. There are restrooms and a large parking lot. No fee (2008). Self-guided rafting trips start here, so you might see piles of yellow boats. A covered bridge is just upstream, but out of sight. Private Knight's Ferry Resort (restaurant, campground, weddings) situated on the right bank. Above the rapid, a signed portage trail begins on the left. Its sign might be somewhat obscured by vegetation. At higher flows, water actually flows down the portage trail. Most of the water goes down the far right channel. 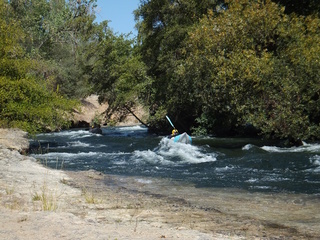 You can avoid the biggest whitewater holes by entering this channel on the left, working right, then left again at the bottom. 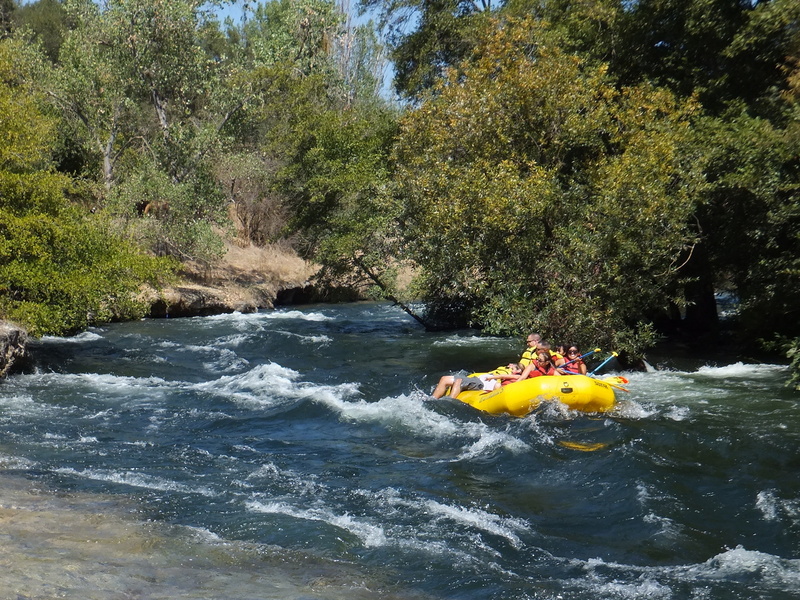 Conversely, you can hit the biggest whitewater by entering right, working left, then right again at the bottom! 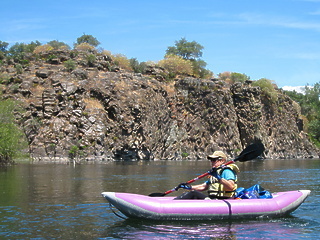 Scenic lava outcroppings, followed by a wide spot with current on the left and shallow water on the right. View of Lover's Leap on the left bank straight ahead. 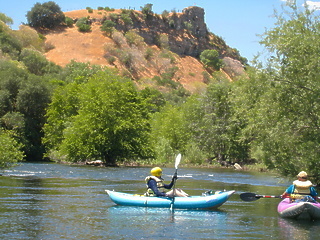 It is a butte with cliff facing the river and a flag flying on top. 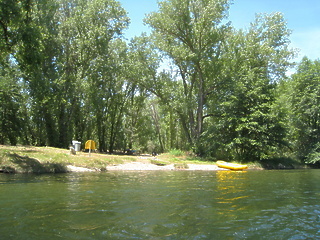 Boat-in campground on the right bank. It has many fine tent sites, two bathroom facilities, and garbage pickup by gated road access. 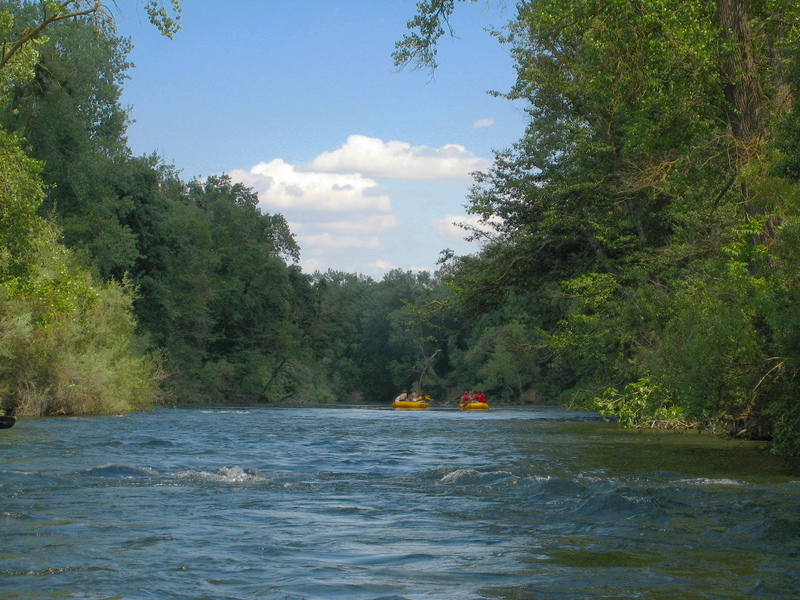 Reasonable fee, first-come-first-served for boaters (2008). Bayou or lake where the river backs up on the right side. A sign says to take the left channel, because it is not obvious. However the sign could be mostly covered by vegetation. Another bayou, but the best channel is more obvious. River access from Orange Blossom Road. Just around the corner, you might see vehicles parked. 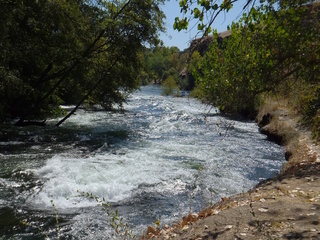 Stretch of fast water begins, where the river splits, with most current going left. 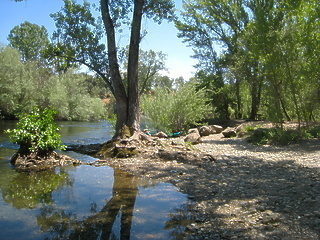 Large pool on the right, after the river has slowed down. Orange Blossom road bridge, your take-out. Another boat-in campground, according to reports. Although vehicle access is possible, only boaters are allowed to camp. Past the usual take-out at Orange Blossom bridge, the river continues to flow nicely with moderate gradient. Soon more houses become visible as you approach Oakdale. If you run this section, you can take out at the highway 108/120 bridge. Below Oakdale down to Riverbank, the river flattens out. To reach take-out, drive east on highway 108/120 from Oakdale several miles to the Orange Blossom Road turnoff. Follow this road east and north to the river. 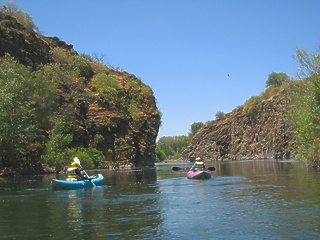 After the bridge, turn immediately left, and again left into the BLM access. To reach put-in from there, continue east and north on Orange Blossom Road to its intersection with Sonora Road, where you turn right and proceed southeast to the town of Knight's Ferry. Just past town, near the concrete bridge leading to highway 108/120, continue into the BLM access upstream on the right bank. To find nearby food and lodging, type Oakdale into the box and click Search.